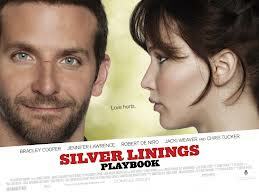 Speakin' Geek: A second time, 'Silver Linings Playbook'. It has been over two months since I saw this film. When I see a film I always jump in an say how I feel without fully thinking. Now, looking back I can give you a fully educated opinion on the 'Silver Linings Playbook'. Bradley Cooper has always been a good actor to me, but that is it. A good actor, not a great actor, a good actor. Jennifer Lawrence, knowing her recent films, 'X-Men; First Class' and 'The Hunger Games', I had an idea of her acting range, or so I thought. Supported by Robert De Niro and Chris Tucker I really wasn't sure where this could go. The film centres around Bradley Coopers character, Pat, who has only recently come out of a mental institution and has moved back in with his mother and father,Dolores(Jacki Weaver) and Pat Sr(Robert De Niro). After a break-down, that is fairly disturbing when it is shown in a flashback, Pat is trying desperately to get his life back together, which includes getting his teaching job back and his estranged wife. He then meets Jennifer Lawrence's character,Tiffany, an emotionally broken woman who rivals him with her emotional complexities. Throughout the whole film there is a wonderful back and forth between them that evolves and grows and I will not spoil it anymore. I'm thinking about this film and it just hit me hard. Bradley Cooper came off as such a unique character who goes through such a journey over the course of the film. Nothing ever feels forced, his evolution is well treated, as is his mental condition. Jennifer Lawrence really showed an oddball side to herself in this film and I'm excited to see her next film after this. Robert De Niro was great, really back on form after such disappointments as 'Little Fockers' and 'New Year's Eve'.A real surprise for myself was Chris Tucker, who performs wonderfully as Danny, Pats friend from the mental institution. The cinematography was well done, there are genuine moments when I felt, like Pat, claustrophobic in his confrontational moments with characters and it was all done through the camera work. I always find it difficult to find the bad in a film, especially when I really enjoyed it. It is like tunnel vision, where once I've enjoyed a film, I block out the bad. It's a habit i've gotten into. Looking at the film, I have figured out what I didn't like about it. There are some characters that just come off as douches, one character in particular comes to mind. It just comes off at times that every single person is angry in this film at some point and I mean everyone,except maybe Chris Tucker which is cool because it makes his character that little bit more unique. It just puts a smile on your face. I hope you've enjoyed my review. This film deserved a second look and I am glad I have been given the opportunity to write this again. Cheers.